There will be sung Latin Masses at 6pm in St Wilfrid's Church, York on both these Feasts. The Feast of All Saints (1st November) is, of course, a Holyday of Obligation. On the Feast of All Souls (2nd November) we remember the faithful departed with a Requiem Mass. On this occasion, I understand that the choral scholars will be enhanced by members of the University choir, so we can expect some first class singing. Archbishop Vigano has issued a third document, in which he responds to Cardinal Oulett, and refutes some of Cardinal Oullet's assertions. The full text of Archbishop Vigano's third testimony can be found on Life Site News and elsewhere, and is well worth reading. A particularly useful feature of this latest disclosure is that it contains a concise summary of the Archbishop's original evidence, and I reproduce it here for the convenience of anyone who does not wish to wade through the original 11 page document. In November 2000 the U.S. nuncio, Archbishop Montalvo, informed the Holy See of Cardinal McCarrick’s homosexual behavior with seminarians and priests. In December of 2006 I myself wrote a memo to the Secretary of State, Cardinal Bertone, and personally delivered it to the Substitute for General Affairs, Archbishop Leonardo Sandri, calling for the Pope to bring extraordinary disciplinary measures against McCarrick to forestall future crimes and scandal. This memo received no response. The Institute of Christ the King Sovereign Priest is to have a foundation in Shrewsbury. It has been announced that Bishop Davies has invited the Institute to have a second permanent presence in his diocese. Canon Smith, who comes from Arcansas in the USA, along with a seminarian will be taking up residence at St Winefride's Church, which is part of the Cathedral parish in Shrewsbury. Besides celebrating Sunday and weekday Masses at St Wilfrede's, Canon Smith will have some duties at the cathedral. 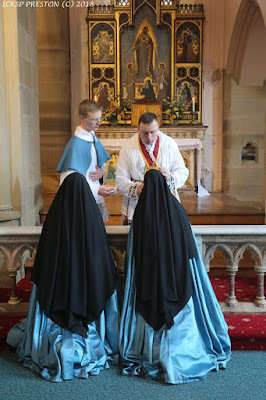 Although the Institute of Christ the King already has charge of three churches in England (one at New Brighton and two in Preston), it is a new development for any traditional order of priests to have regular duties at a cathedral. This is further evidence of the integration of the Latin Mass into Catholic life in this country. Canon Smith will be arriving in England before the end of September. It has been announced that Bishop Egan of the Portsmouth Diocese is to erect a Personal Parish for those attached to the traditional form of the Mass. It will be centred around Reading, where the Priestly Fraternity of St Peter have their own house and have been offering Mass at the Church of St William of York for the last 17 years. Fr Matthew Goddard of the FSSP will be the Parish Priest, and the announcement states that the new parish will be based at the Church of St William of York until a permanent home is found. At present, use of the church is shared between the FSSP and the the local novus ordo parish. The new personal parish, which will be dedicated to St John Fisher, will be the first Latin Mass personal parish in Britain, and only the fourth in Europe, although there are about 40 in the United States. 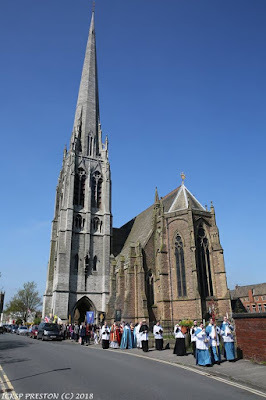 It will differ from the shrine churches in New Brighton, Warrington and Preston, in that a parish has certain duties, including maintaining baptismal and marriage records. The suggestion that St William's is a temporary home, will lead to speculation that the FSSP will be handed a church for their exclusive use at some future date. Presumably, this will happen as a result of some reorganisation and amalgamation of parishes in the Reading area. There will be a Low Mass in the Extraordinary Form offered by Fr Mark Drew at the Church of St Mary and St Joseph, Baxtergate in Hedon on Sunday 9th September at 5pm. As I was collecting Mass books etc at the back of St Wilfrid's Church in York after the Latin Mass last Sunday, an elderly man approached me and asked why it was that he had been refused Communion. He went on to express his outrage that Communion could only be given on the tongue. I responded that it was the law of the Church that at Older Form Masses for Communion is given on the tongue. At this point, he became fairly aggressive and spoke in such a loud voice that he attracted the attention of people nearby, some of whom decided to join in the debate. He then said that he was a priest, and had been for 62 years, and claimed that he had been ordained long before all those around him were even born. This could not be true in my case, but he probably did not realise how old I am, so I will forgive him for that error. Although I would have liked to debate with him, he was so aggressive that no reasonable discussion was possible. I was anxious to calm the man down, as such a public row in a church seemed improper. I asked him where he came from, and he replied: Australia. Eventually he moved on to do battle with Br Henry, who was outside the church. I had noticed this elderly man when he entered the church before Mass, perhaps because he was particularly tall. He went to sit in the front row. At Communion time, he stood up and remained standing at his place in a conspicuous way. He did not go to the altar rails to receive Communion, so his allegation that he was refused Communion was not true. What was true was that, as is normal in St Wilfrid's, there was an announcement that the "law of the Church required that Communion is received on the tongue and kneeling....". This is presumably what annoyed him, as it was clear from the way he stood at the front of the church whilst others were receiving Communion time that he was trying to make some point. Why am I relating this story? It is only to illustrate how how irrational some people (including priests) are when they encounter traditional practices. This priest claimed that he was not able to receive Communion because it was being distributed on the tongue. As Br Henry pointed out this is an example of the sin of Pride. What is more serious is that he was prepared to have a major row inside a church on the issue. Everything is compounded by his being a priest. There will be a Latin Low Mass at 5pm on Sunday 8th July at the Church of St Mary & St Joseph in Hedon. The celebrant will be Fr Mark Drew. There will be a Sung Latin Mass for the Feast of Corpus Christi at St Wilfrid's Church in York on Thursday 31st May at 6pm. The Choral Scholars will be singing Josquin's setting of the Mass, Pange Lingua. According to the Ugandan newspaper, the Daily Monitor, a Latin Mass is offered every Sunday at the Catholic Management and Training Institute in Rubaga in Uganda. This Institute is associated with the local cathedral. The Mass is celebrated by Fr Christophe Nouveau, who, it seems, is the only priest in Uganda able to offer mass in the traditional form, although two more have now been sent to France for training. Parishioners of Rubaga had contacted Fr Nouveau in 2004 when he was stationed in Kenya, but had to wait until 2015, when Fr Nouveau moved to Kenya, for a regular Latin Mass. Fr Nouveau also travels to Rwanda, Tanzania and Burundi to celebrate occasional Latin Masses. The fact that Ugandan priests are being sent to France to be trained in celebrating the Latin Mass, is a very encouraging move, and suggests that at least some Ugandan bishops are accepting, if not encouraging, greater availability of the Latin Mass. This and similar reports suggest that we can expect a great expansion in the availability of the Latin Mass on the African continent. The pilgrimage in honour of the Martyrs of England & Wales held in Preston last Saturday went very well. It was a beautiful day with a completely blue sky, which enabled some excellent photographs to be taken. 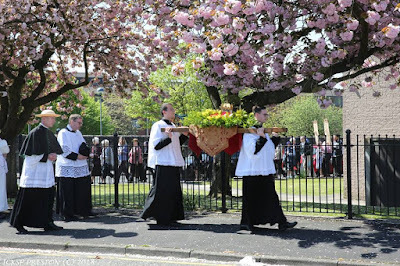 Starting at St Walburge's Church, the procession moved through pleasant tree lined streets to the English Martyrs Church, a distance of about a mile. The Rosary was recited, as was a litany of the English Martyrs, and hymns were sung. A couple of main roads were crossed, but this caused little disruption and vehicles courteously gave way to the estimated 150 people taking part. About another 50 people were waiting at the English Martyrs Church for the Solemn Mass. The Sisters sang the propers of the Mass beautifully, as did the choir who sang Byrd's Mass for Three Voices. Afterwards refreshments were served in the adjacent hall. Last November, the Institute of Christ the King Sovereign Priest opened a House of Discernment for young men exploring their priestly vocations. Four potential priests took up residence in the presbytery attached to St Walburge's Church in Preston. As it has turned out, one dropped out of the scheme part way through, but two are now submitting their applications to join the Institute's seminary at Gricigliano. A further one has decided to pursue a vocation as an Oblate in the Institute. This is very good news. The Institute is now advertising for candidates for next year's intake, who will enter the House of Discernment in November. Let us hope that there will be plenty of applicants. Due to the absence of Fr Drew, there will be no Latin Mass at Hedon on Sunday 13th May. I may have caused some confusion in an earlier post by saying that there will be no Mass on 6th May. This was an error. The Latin Masses at Hedon are on the second Sundays of the month at 5pm. 5th May is the Feast of the Martyrs of England and Wales. 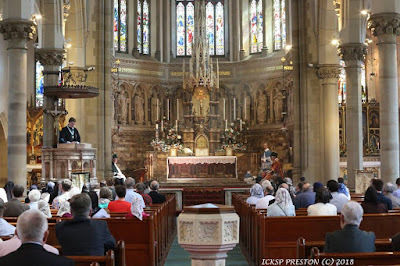 It will be celebrated in Preston on Saturday 5th May with a pilgrimage jointly organised by the Latin Mass Society and the Institute of Christ the King Sovereign Priest. Pilgrims should assemble at St Walburge's Church at 11.45 for the procession that will depart at noon. It is about a mile to the Church of the English Martyrs where a Solemn Mass will be offered. The weather forecast is good, so the organisers are hoping for a good turnout. Bring banners if you can. The Usus Antiquior and the Seminarians of Paris. Fr Michael Brown has picked up an interesting story from a French website. Apparently it is the custom at the seminary serving the Archdiocese of Paris, that each year the students are given the opportunity to study an extra subject that is normally outside the curriculum. The subject is selected by some form of ballot. On Sunday I was one of 30 people who traveled by coach from York to Scarborough for the Rosary on the Coast. There, we met 100 others gathered next to the life boat station to recite the Litany of Loretto, sing hymns and say the Glorious Mysteries of the Rosary. We were one of about 400 groups around the coasts of the British Isles doing the same thing at the same time. If our gathering was of typical size, that would amount to about 52,000 people involved. The organisers, who are mostly lay people, must be congratulated on a great success of this project. I do hope that the project will be repeated in future years. If that happens I would be keen to give a hand with the organisation, with a view to getting even more groups involved. There is surely scope for expansion. Along the length of the coast of the Diocese of Middlesbrough there were seven locations, namely: Redcar, Saltburn, Whitby, Scarborough, Hornsea, Withernsea, Hull and Hessle. It would be nice if a few more, such as Filew and Bridlington, were added. Indeed, looking at the map of all the locations, the Yorkshire coast had relatively few flags compared with most parts of the country. One small amusing anecdote. Our group gathered at the highest part of the beach at Scarborough, with the water line several yards away. There did not appear to be any threat from the rising tide, but as the rosary progressed, the water came closer and closer at a remarkable speed. Those at the lower end of the group had to close in on the others. By the time we dispersed, there was no beach left with everyone huddled on a paved slipway. I don't know whether anyone checked the tide times before the event, but if it had been 30 mins later, we would have been in trouble. There will be NO MASS at Hedon on Sunday 6th May, due to Fr Drew not being available. Next Sunday, 29th April, is the day designated for Rosary on the Coast. The idea, copied from Poland is to have groups reciting the rosary for faith, life and peace all around the coast of Britain. A few day ago, it was reported that 10,000 people were expected to participate at 247 locations notified to the central organisers. However, more information is coming in all the time, so these numbers will almost certainly be exceeded. There will be a pilgrimage in honour of the English Martyrs at Preston on Saturday 5th May. Pilgrims are invited to gather at 11.45am in St Walburge's Church, where there will be devotions, before the procession sets off at noon. As you can see from the picture, St Walburge's has a very tall spire. In fact it is the third highest spire in England, after Salisbury Cathedral an Norwich Cathedral. It can be seen for miles around, so should not be too difficult to find. The Postcode is PR2 2QE for those navigating with the aid of satnav. It is a little under a mile to the church of the English Martyrs, where Mass will be celebrated at around 12.30 pm. As you can see from this photograph, this is also a large church, although it's spire never got built. Both churches are magnificent inside, although the following pictures do not do them justice. The Church of the English Martyrs occupies a very historic site, as it was built at the place of execution of some of the leaders of the 1745 Jacobite Rebellion - a very good reason to attend the pilgrimage. Another good reason to attend the pilgrimage is that it is being led by the Institute of Christ the King, Supreme Priest - something that will surely guarantee the success of the event. According to a report by Stephen Bullivant, Professor of Theology and Sociology at St Mary's University, just under 10% of young people aged 16 to 29 regard themselves as Catholic. This compares with 7% who claim to be C of E and 6% Muslim. This is based on a European Social Survey conducted 2014 to 2016. The survey is a snapshot, so does not strictly indicate trends. However, the fact that the figures are only for young people does indicate that within the next 15 years, there will be more Catholics and more Muslims than members of the Church of England. The report does not mention that the survey covers the whole of the UK, whereas the C of E only covers England. I presume adjustment has been made for this. The Requiem Mass of Francis (Frank) Shepherd will take place at the Church of St Mary and St Joseph, Hedon, on Tuesday 6th March at 12 noon. Frank Shepherd, who lived in Hedon, has been attending the the Sunday Latin Masses in York and Hedon. There will be a Mass in the Extraordinary Form, preceded by the blessing and distribution of Ashes at St Wilfrid's Church in York on Wednesday 14th February. Ash Wednesday is a day of fast and abstinaece. On Sunday 11th February, being the second Sunday of the Month, there will be a Low Mass in the Extraordinary Form at the Church of St Mary & St Joseph in Hedon. It will be at 5pm and celebrated by Fr Mark Drew, who is Parish Priest there. The church is in Baxtergate and the postcode is HU12 8JN. Baxter ate is part of a one way system in Hedon, so most people will have to approach via St Augustinegate, which is the main street. The church is hard to spot, because it is behind the presbytery. The most noticeable thing is a large crucifix in the garden, but by the time you have noticed that, you will probably have passed the entrance, and may have to go round the one way system again. It is best to look for the Shakespeare Inn. The entrance to the church is next to the pub's car park.